Bill Durodié is a member of the advisory board of the Scientific Alliance and is part of the LM network, having contributed to Living Marxism, Audacity, the Institute of Ideas and Spiked and being a founder member of the Manifesto Club. He is described on the Spiked website as an "Advisor to the Prime Minister's Cabinet Office Strategy Unit study 'The Costs and Benefits of Genetically Modified (GM) Crops.'" This study formed the economic strand that complemented the UK government's Public Debate on GM crops which culminated in 2003. He was previously Director of the International Centre for Security Analysis, and Senior Research Fellow in the International Policy Institute, within the War Studies Group of King's College London. Durodié was educated at Imperial College London where he gained a BSc in Physics, the London School of Economics, where he got an MSc in Economics which takes two years where students 'first degree did not specialise in economics.' and New College Oxford. In 2007 he was reportedly 'awarded a PhD by Public Works from Middlesex University'. He is a Fellow of the Royal Society for the Arts (FRSA), an Associate Fellow of Chatham House (the Royal Institute of International Affairs), an Associate of the Royal College of Science (ARCS), a Member of the Society for Risk Analysis, and an Advisory Forum Member of the Scientific Alliance. Bill Durodié is Senior Lecturer in Risk and Corporate Security at Cranfield University. He was previously Director of the International Centre for Security Analysis, and Senior Research Fellow in the International Policy Institute, within the 5* Research Assessment Exercise rated War Studies Group of King's College London. His main research interest is into the causes and consequences of our contemporary consciousness of risk. He is also interested in examining the erosion of expertise, the demoralisation of élites, the limitations of risk management, and the growing demand to engage the public in dialogue and decision-making in relation to science. Bill was educated at Imperial College, the London School of Economics, and New College, Oxford. He is a Fellow of the Royal Society for the Arts (FRSA), an Associate Fellow of Chatham House (the Royal Institute of International Affairs), an Associate of the Royal College of Science (ARCS), a Member of the Society for Risk Analysis, and an Advisory Forum Member of the Scientific Alliance. His work has appeared and been commented on in a wide range of publications, and he is regularly requested to provide expert commentary for television and radio broadcasts. Bill featured in the BAFTA award-winning BBC documentary series produced by Adam Curtis, The Power Of Nightmares: The Rise of the Politics of Fear. Circa 1996 European Projects Officer, Kingsway College, Longford Street, London NW1 3HB. 1996-2000 Durodie wrote three articles for Living Marxism/LM between issue 86, January 1996 and LM 126, December/January 1999/2000. Circa 1998, 'Director' of Objective Europe which was described in Living Marxism as an 'independent research group' in October 1998. Durodie is a Senior Research Fellow & Project Co-ordinator for the Domestic Management of Terrorist Attacks Programme, at the Centre for Defence Studies, which is part of the International Policy Institute at King's College London. He also says he has, 'Worked as a European advisor within both the private and public sectors, including a secondment to the Government Office for London'. On behalf of King's College London, Durodie organised the conference, "Communicating the War on Terror", which took place at the Royal Institution in June 2003. Among those chairing sessions at the two-day event were Fiona Fox (director of the Science Media Centre) and Bruno Waterfield. Like Durodie, Fiona Fox and Bruno Waterfield have been contributors to the magazine LM, formerly Living Marxism . Among the conference speakers were Frank Furedi, Phil Hammond, Michael Fitzpatrick and Mick Hume, all of whom connect to LM and the Revolutionary Communist Party out of which it emerged. Another LM contributor, Ellen Raphael, the Assistant Director of Sense About Science, assisted Durodié with organising the event. The fact that all these people had long term connections to each other and have been part of the same extreme political network does not appear to have been disclosed to those attending the conference. It can hardly be considered irrelevant given that the Revolutionary Communist Party, contributors to LM/Living Marxism , and the RCP's front group, the Irish Freedom Movement, which Fiona Fox at one time headed, all supported the 'armed struggle' in Northern Ireland, and refused to condemn any of the acts of terror of the IRA. They also, after the IRA announced their ceasefire, opposed the peace process and LM provided a platform for dissident republican views in articles written by Fox (under her alias Fiona Foster). Durodie himself frequently cites the RCP's chief ideologist, Frank Furedi, in his publications, and has contributed to all the network's main platforms: LM, Spiked and the Institute of Ideas. Many of Durodie's papers have been published by far-right think tanks, eg the Competitive Enterprise Institute (Poisonous Propaganda) and the European Science and Environment Forum (Poisonous Dummies), or by Living Marxism network connected groups, eg the Institute of Ideas (Can we trust the experts?) and Audacity.org (Society loses when the polluter is made to pay). 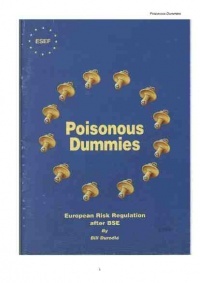 Bill Durodie Poisonous Dummies: European Risk Regulation after BSE, The European Science and Environment Forum, 1999. Bill Durodie, Poisonous Propaganda: Global Echoes of an Anti-Vinyl Agenda (Washington, D.C.: Competitive Enterprise Institute, July 2000). Bill Durodie The Demoralization of Science, ESEF, July 2002. Bill Durodie The precautionary principle is causing a scare: It's time to apply the precautionary principle to itself. Risk of Freedom Briefing, July 2002. Bill Durodié, Plastic Panics: European Risk Regulation in the Aftermath of BSE, pp.140-166 in Rethinking Risk and the Precautionary Principle, Morris, J. (ed. ), Butterworth-Heinemann, Oxford, 2000. Bill Durodié, Trust comes from Expertise, pp.17-38 in Science: Can We Trust the Experts?, Gilland, T. (ed. ), Hodder & Stoughton, Abingdon, UK, 2002. Bill Durodié, Why has Europe become so Risk-Averse? pp.39-46 in Breaking Down the Barriers, Disney, H. (ed. ), Civitas, London, 2003. Bill Durodié, The Precautionary Principle: Is it Killing Innovation? pp.68-77 in An Apology for Capitalism?, Kumaria, S. (ed. ), Profile Books, London, 2004. Bill Durodié, Cultural Precursors and Psychological Consequences of Contemporary Western Responses to Acts of Terror, pp.37-53 in Psychological Responses to the New Terrorism: A NATO-Russia Dialogue, Wessely, S. and Krasnov V. (eds. ), IOS Press, Amsterdam, 2005. Bill Durodié, Limitations of Public Dialogue in Science and the Rise of New ‘Experts’, pp.82-92 in The Changing Role of the Public Intellectual, Cummings, D. (ed. ), Routledge, Oxford, 2005. Bill Durodié, Cultural Precursors and Psychological Consequences of Contemporary Western Responses to Acts of Terror, pp.307-326 in Vol.3 of The Psychology of Resolving Global Conflicts, Fitzduff, M. and Stout C. (eds. ), Praeger Press, Westport, Virginia, 2006. Bill Durodié, What Can the Science and Technology Community Contribute? pp.38-50 in Science and Technology Policies for the Anti-Terrorism Era, James, A. (ed. ), IOS Press, Amsterdam, 2006. Bill Durodié, Cultural Precursors and Psychological Consequences of Contemporary Western Responses to Acts of Terror, pp.31-47 in Science and Society in the Face of the New Security Threats, Sharpe, M. and Agboluaje A. (eds. ), IOS Press, Amsterdam, 2006. Bill Durodié, Understanding the Broader Context, pp.193-211 in Technology and Security: Governing Threats in the New Millennium, Rappert, B. (ed. ), Palgrave Macmillan, New York, 2007. Bill Durodié, Home-Grown Nihilism: The Clash Within Civilizations, pp.117-128 in Britain and Security, Cornish, P. (ed.) The Smith Institute, London, 2007. Bill Durodié, What Can the Science and Technology Community Contribute? pp.123-137 in Social and Psychological Effects of Radiological Terrorism, Khripunov, I. Bolshov, L. and Nikonov, D. (eds.) IOS Press, Amsterdam, 2007. Bill Durodié, Fear in an Age without Meaning, pp.123-136 in Fear: Essays on the Meaning and Experience of Fear, Hebblethwaite, K. and McCarthy, E. (eds.) Four Courts Press, Dublin, 2007. Bill Durodié, Les Attentats de Londres de Juillet 2005: Un Nihilisme ‘Made in the UK’, pp.293-301 in Au Nom du 11 Septembre … Les Démocraties à L’Épreuve de L’Antiterrorisme, Bigo, D. Bonelli, L. and Deltombe, T. (eds. ), Editions La Découverte, Paris, 2008. Bill Durodié, Ethical Dialogue about Science in the Context of a Culture of Precaution, pp.105-122 in The Ethics of Protocells: Moral and Social Implications of Creating Life in the Laboratory, Bedau, M. and Parke, E. (eds. ), The MIT Press, MA, May 2009. Bill Durodié, Pulp Friction: Southern Environment or Western Agenda? pp.84-86 in Strategic Currents: Issues in Human Security in Asia, Kassim, Y. (ed. ), RSIS, Singapore, 2011. Bill Durodié, Infectious Disease Outbreaks: Crafting a Response, pp.75-77 in Strategic Currents: Issues in Human Security in Asia, Kassim, Y. (ed. ), RSIS, Singapore, 2011. Bill Durodié, Cultural Precursors and Sociological Consequences of Contemporary Western Responses to Acts of Terror, pp.75-104 in Aspects of Terrorism and Martyrdom: Dying for Good, dying for God, Rogers M., Lewis, C., Loewenthal, K., Amlot, R., Cinnirella, M. and Ansari, H. (eds. ), The Edwin Mellen Press, UK, 2013. Bill Durodié, Demographic Ageing in China: Economic Problem or Social Opportunity? (with Mullan, P.), pp.255-266 in East and South-East Asia: International Relations and Security Perspectives, Tan, A. (ed. ), Routledge, NY, April 2013. Bill Durodié, Resilience or Panic? The Public’s Response to a Terrorist Attack, (with Wessely, S.), The Lancet, Vol.360, No.9349, pp.1901-1902, 6 December 2002. Bill Durodié, The Precautionary Principle in the 20th Century: Late Lessons from Early Warnings, Risk Analysis, Vol.22, No.6, pp.1208-1209, December 2002. Bill Durodié, Limitations of Public Dialogue in Science and the Rise of New ‘Experts’, Critical Review of International Social and Political Philosophy, Vol.6, No.4, pp.82-92, Winter 2003. Bill Durodié, The True Cost of Precautionary Chemicals Regulation, Risk Analysis, Vol.23, No.2, pp.389-398, April 2003. Bill Durodié, Letter to the Editor Regarding Chemical White Paper Special Issue, Risk Analysis, Vol.23, No.3, pp.427-428, June 2003. Bill Durodié, Invited Comment, Journal of Risk Research, Vol.6, No. 4-6, pp.597-601, July 2003. Bill Durodié, The Globalization of Terrorism, The Global Review of Ethnopolitics (now Ethnopolitics), Vol.3, No.2, pp.108-109, January 2004. Bill Durodié, The Timid Corporation: Why Business is Terrified of Taking Risk, Risk Analysis, Vol.24, No.1, pp.301-304, February 2004. Bill Durodié, Facing the Possibility of Bio-Terrorism, Current Opinion in Biotechnology, Vol.15, No.3, pp.264-268, June 2004. Bill Durodié, Cellular Phones, Public Fears, and a Culture of Precaution, Risk Analysis, Vol.24, No.4, pp.1066-1068, August 2004. Bill Durodié, Civilian Morale during World War Two: Responses to Air-Raids Re-Examined, (with Jones, E., Woolven, R. and Wessely S.), Social History of Medicine, Vol.17, No.3, pp.463-479, December 2004. Bill Durodié, The Limitations of Risk Management in Dealing with Disaster: Building Social Resilience, Politik, Vol.8, No.1, pp.14-21, March 2005. Bill Durodié, Inclusion versus Experimentation: A reply to Roland Jackson et al., Critical Review of International Social and Political Philosophy, Vol.8, No.3, pp.359-362, September 2005. Bill Durodié, Imperial Hubris: Why the West is Losing the War on Terror, Journal of Strategic Studies, Vol.28, No.5, pp.897-900, October 2005. Bill Durodié, Contending Cultures of Counterterrorism – A Reply, International Affairs, Vol.82, No.1, pp.195-196, January 2006. Bill Durodié, Public Panic and Morale: World War Two Civilian Responses Re-Examined in the Light of the Current Anti-Terrorist Campaign, (with Jones, E., Woolven, R. and Wessely S.), Journal of Risk Research, Vol.9, No.1, pp.57-73, January 2006. Bill Durodié, Risk and the Social Construction of ‘Gulf War Syndrome’, Philosophical Transactions of the Royal Society B, Vol.361, No.1468, pp.689-695, April 2006. Bill Durodié, Containment: Rebuilding a Strategy against Global Terror, International Affairs, Vol.83, No.4, pp.827-828, July 2007. Bill Durodié, Suicide Bombers v Sexual Abusers: A Battle of Depravity or Western Fixations?, Security Journal, Vol.20, No.3, pp.146-157, July 2007. Bill Durodié, Fear and Terror in a Post-Political Age, Government and Opposition, Vol.42, No.3, pp.427-450, July 2007. Bill Durodié, Democratizing Technology: Risk, Responsibility and the Regulation of Chemicals, Electronic Journal of Sustainable Development, Vol.1, No.2, pp.5-6, Spring 2008. Bill Durodié, Media, War and Postmodernity, Media, War and Conflict, Vol.1, No.1, pp.125-126, April 2008. Bill Durodié, Worst Case Scenarios, International Affairs, Vol.84, No.3, pp.567-568, May 2008. Bill Durodié, Human Security – A Retrospective, Global Change, Peace & Security, Vol. 22, No. 3, pp.385-390, October 2010. Bill Durodié, H1N1 – The Social Costs of Élite Confusion, Journal of Risk Research, Vol.14, No.5, pp.511-518, June 2011. Bill Durodié, Reconciling Growing Energy Demand with Climate Change Management, Global Change, Peace & Security, Vol. 23, No. 2, pp.271-282, June 2011. Bill Durodié, H1N1 – The Social Costs of Cultural Confusion, Global Health Governance, Vol. 4, No.2, pp.1-19, June 2011. Bill Durodié, The Changing Nature of Riots in the Contemporary Metropolis from Ideology to Identity: Lessons from the Recent UK Riots, Journal of Risk Research, Vol. 15, No. 4, pp.347-354, May 2012. Bill Durodié, Precautionary Tales: Missing the Problem and the Cause, European Journal of Risk Regulation, Vol.4, No.2, pp.297-299, June 2013. Bill Durodié, Plastic Panics and the Perils of the Precautionary Principle a longer version of an article which appeared in the Wall Street Journal 9 June 1999. Reproduced from the website of the European Science and Environment Forum. Bill Durodié, 'Troubled waters: a tale of mad salmon', The Wall Street Journal (European Edition), 11 January 2001. Bill Durodié, 'Why I … think a dialogue with the public will undermine science', Times Higher Education Supplement (UK), 12 April 2002. Bill Durodié, 'Men without a mission make poor soldiers', Times Higher Education Supplement (UK), 21 February 2003. Bill Durodié, 'A diabolical deal that still endangers democracy', Times Higher Education Supplement (UK), 28 March 2003. Bill Durodié, 'The fear and self-loathing in Las Vegas', Times Higher Education Supplement (UK), 17 October 2003. Bill Durodié, 'From the rules of engagement to passionless marriages', Times Higher Education Supplement (UK), 28 November 2003. Bill Durodié, 'Social bonds can withstand most bombs', Times Higher Education Supplement (UK), 19 December 2003. Bill Durodié, 'Political tunnel vision is today’s real terror', Times Higher Education Supplement (UK), 29 March 2004. Bill Durodié, 'Don’t send in the tanks', Times Higher Education Supplement (UK), 30 July 2004. Bill Durodié, 'Terror in the first person', Times Higher Education Supplement (UK), 5 August 2005. Bill Durodié, 'We are the enemies within', Times Higher Education Supplement (UK), 22 September 2006. Bill Durodié, 'Hunters in the House', Spiked, 24 September 2004. Bill Durodié, 'Tempted by terror', Spiked, 14 November 2006. Bill Durodié, 'A battle of ideas in which understanding lies among the casualties', Times Higher Education Supplement (UK), 19 January 2007. Bill Durodié, 'Attentats de Londres et de Glasgow: pourquoi? ', La Presse (Canada), 7 July 2007. Bill Durodié, 'Between Iraq and a hard place', Times Higher Education Supplement (UK), 31 January 2008. Bill Durodié, 'History: it's just one bloody thing after another', Spiked, 30 May 2008. Bill Durodié, 'China’s helpful role in the new world order', China Daily (PRC), 23 July 2008. Bill Durodié, 'Recession and unrest: cauldron may not boil over', The Straits Times (Singapore), 28 May 2009. Bill Durodié, 'H1N1: a true test of Singaporean unity', Today (Singapore), 19 June 2009. Bill Durodié, 'Understanding radicalization', The New York Times (US), 15 July 2009. Bill Durodié, 'The forgotten role of government', The Straits Times (Singapore), 8 August 2009. Bill Durodié, 'Taking off, far easier than taking over', The Straits Times (Singapore), 5 December 2009. Bill Durodié, 'What have we learnt from H1N1? ', Today (Singapore), 13 April 2010. Bill Durodié, 'Airspace closure may have cost lives', Today (Singapore), 3 May 2010. Bill Durodié, 'Friction and vested interests in pulp and palm oil production' (available via the Internet Archive), The Jakarta Post (Indonesia), 27 May 2010. Bill Durodié, 'What to expect when the unexpected hits', The Straits Times (Singapore), 21 July 2010. Bill Durodié, 'The benefits of an ageing population in Asia', The Jakarta Globe (Indonesia), 31 August 2010. Bill Durodié, 'The West still needs to think big', The Independent (UK), 30 September 2010. Bill Durodié, 'It’s the quality of life [that matters]', Today (Singapore), 12 February 2011. Bill Durodié, 'Disaster hacks should stick to the facts', Today (Singapore), 18 March 2011. Bill Durodié, 'Welcome to the brave new world of risk-obsessed politics', Today (Singapore), 25 March 2011. Bill Durodié, 'H1N1 fear a result of ‘cry wolf’ mindset? ', The Straits Times (Singapore), 25 March 2011. Bill Durodié, 'Sounding worse when things are really getting better', Today (Singapore), 29 March 2011. Bill Durodié, 'Why so-called corporate social responsibility is not the answer to our problems', City AM (UK), 24 October 2011. Bill Durodié, 'Corporate Social Responsibility: More Harm than Good', The Independent (UK), 31 October 2011. Bill Durodié, 'Fear of Adults has Devastating Effect for Kids', Times Colonist (Canada), 15 August 2012. Bill Durodié, 'Time for the Majority to be Politically Engaged', Times Colonist (Canada), 17 May 2013. Bill Durodié, 'Terrorism: a homegrown fear', Spiked, 11 September 2013. Bill Durodié, Putting the human soul on the slab, Spiked, 26 November 2013. Bill Durodié, 'Six Actions that will Create a More Positive World', Times Colonist (Canada), 4 January 2014. Bill Durodié, 'High Tech depends on us', Times Colonist (Canada), 6 March 2014. Bill Durodié, 'Dying for a purpose', Spiked, 8 August 2014. Bill Durodié, 'Charlie Hebdo: more security isn’t the solution', Spiked, 12 January 2015. Bill Durodié, 'Bitter Lake: searching for meaning in the Afghan abyss', Spiked, 5 February 2015. Bill Durodié, 'Prevent: a very risky strategy', Spiked, 19 March 2015. Bill Durodié, 'Lee Kuan Yew: the last of the great authoritarians', Spiked, 24 March 2015. Bill Durodié, 'Anti-terror: the perversion of tolerance', Spiked, 13 May 2015. Bill Durodié, 'The pretentious nihilism of Plane Stupid', Spiked, 14 July 2015. Bill Durodié, The rise of the populists is bad news for Remain, Spiked, 21 June 2016. Durodie, B. (2000). "Calculating the cost of caution." Chemistry & Industry(5): 170-170. Durodie, B. (2002). "The precautionary principle in the 20th century: Late lessons from early warnings." Risk Analysis 22(6): 1208-1209. Durodie, B. (2003). "Letter to the editor regarding chemical white paper special issue." Risk Analysis 23(3): 427-428. Durodie, B. (2003). "The true cost of precautionary chemicals regulation." Risk Analysis 23(2): 389-398. Durodie, B. (2004). "Cellular phones, public fears, and a culture of precaution." Risk Analysis 24(4): 1066-1068. Durodie, B. (2004). "Facing the possibility of bioterrorism." Current Opinion in Biotechnology 15(3): 264-268. Durodie, B. (2004). "The timid corporation - Why business is terrified of taking risk." Risk Analysis 24(1): 301-304. Durodie, B. (2005). "Imperial hubris: Why the west is losing the war on terror." Journal of Strategic Studies 28(5): 897-900. Durodie, B. (2006). "Contending cultures of counterterrorism." International Affairs 82(1): 195-196. Durodie, B. (2006). "Risk and the social construction of 'Gulf War Syndrome'." Philosophical Transactions of the Royal Society B-Biological Sciences 361(1468): 689-695. Durodie, B. (2007). "Containment: Rebuilding a strategy against global terror." International Affairs 83: 827-828. Durodie, B. (2007). "Fear and terror in a post-political age." Government and Opposition 42(3): 427-450. Durodie, B. (2008). "Worst-case scenarios." International Affairs 84(3): 567-568. Durodie, B. (2009). "Keeping a cool head." Tce(822-23): 22-23. Durodie, B. and S. Wessely (2002). "Resilience or panic? The public and terrorist attack." Lancet 360(9349): 1901-1902. Jones, E., R. Woolven, et al. (2004). "Civilian morale during the Second World War: Responses to air raids re-examined." Social History of Medicine 17(3): 463-479. Jones, E., R. Woolven, et al. (2006). "Public panic and morale: Second World War civilian responses reexamined in the light of the current anti-terrorist campaign." Journal of Risk Research 9(1): 57-73. Lescoeur, B., J. P. Bouttes, et al. (2003). "Riskworld - Part 3 - Comments." Journal of Risk Research 6(4-6): 587-+. ↑ Bill Durodié, 'Euro food regulation: poisonous dummies', Living Marxism, No. 114 - October 1998, p. 34. ↑ Bill Durodié, 'Euro food regulation: poisonous dummies', Living Marxism, No. 114 - October, p. 34. This page was last modified on 18 October 2016, at 14:06.